Barcelona has a unique culture, which is illustrated by the festivals and events in Barcelona all year round. From flowers to fireworks, singing to sports, Barcelona has many festivities that celebrate its culture and tradition with enthusiasm and zeal. If you are in Barcelona and it happens to late May or early June, be sure not to miss the Corpus Christi celebrations. The ‘magical’ “egg dances” on the fountains of the churches and cathedrals, the processions and rallies with popular traditional dances, and the Corpus Christi masses are the things Barcelona prides on. Sonar is another event that takes place in June. It is one of the biggest music festivals in Europe and music enthusiasts from all over the world visit Barcelona to participate in this three-day extravaganza. Its official name is Advanced Music and Multimedia Art, so don’t get confused when you hear these two names used interchangeably. You can enjoy it throughout the three days and three nights, as there are two types of Sonars: ‘Sonar by Day’ and ‘Sonar by Night’. Festes de la Merce is the main event in Barcelona. It is celebrated during September, and is arguably the most important of all the festivals in Barcelona. This festival brings out the best of Barcelona’s culture, and you can experience some exotic flavors of life during this festival. You may come across the tallest ‘human tower’ you would ever see, witness the rallies carrying the huge wooden human figures dressed regally, see the sky lit with vivid fire-crackers, and get more indulged in the festivities after having Cava, the traditional Champaign of Catalonia. Hotel Rey Juan Carlos is one of the best hotels when it comes to luxury. It is situated just adjacent to the Diagonal Avenue and Fira Conference Centre. With terrace bar, spa facilities, plush furnishings, and a swimming pool, it is considered the best business hotel in Barcelona. With numerous international awards under its belt, Hotel Arts is a miracle of modern architecture and hospitality. With a view of the Mediterranean Sea in its foreground, it gives you the best standard of accommodation with high quality of hospitality. Located in the Eixample area of Barcelona, Hotel Claris is a blend of ancient brilliance and modern facilities. The interiors are exquisite and superbly decorated with Persian rugs, Egyptian carvings, and intricately woven Turkish carpets. Mosaics dating back to the 5th Century Rome are hung along the corridors and rooms, making the hotel graceful. Situated just few hundred meters from the city center is the awe-inspiring site of the lavish Hotel Grand Marina. It will take you less than 15 minutes from the airport to reach this hotel, which is close to most of the tourist attractions. Lose yourself in the opulence of your setting and give your taste buds the treat of a lifetime. Located on the famous Las Rambla, le Meridian holds the distinction of being one of the very few hotels situated in the business and entertainment hub of Barcelona. Many of the tourist attractions are within walking distance from the hotel. 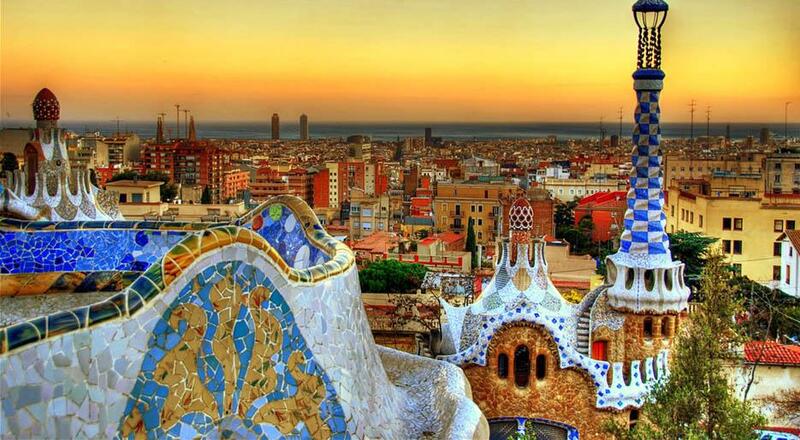 Barcelona is a magnificent and vibrant city with many ancient and modern marvels. One of the plus points of this city is the accessibility for all tourists across a wide economic spectrum. Hotel Cataluna Barcelona:Situated in urban Barcelona near the Catalunya Plaza, this hotel is reasonably priced and has many basic amenities such as: seminar rooms, central heating system and satellite TV. You can enjoy strolling along the pedestrian walkways and roam around the city at ease. Many shopping arcades are also close by for you to buy souvenirs and other antique items. Hotel Medium Prisma: It is located near the commercial town centre of Francese Macia Square. It is well placed for easy access from the City Centre as well as from the airport and railway station. The facilities include TV, AC, central heating, and telephone and computer accessibility. Hotel Medium Abalon: It is located in the city suburbs of Garcia on the Modernisme road. It is suitable for visitors with family and kids, as many cultural and recreational centers are located nearby. The basic facilities like TV and telephone are available in the hotel rooms. Hotel Amrey Sant Pau: It is a reasonably priced hotel offering great number of facilities. At a short distance from Sagrada Familia, it has trouble-free connectivity to all the routes and tourist places of the city. In addition to all the basic facilities, the added services provided are a bar, restaurant, and laundry.